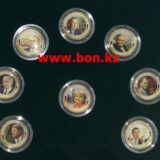 Averse: State Emblem of the Republic of Kazakhstan framed on the top sector; inscription «? 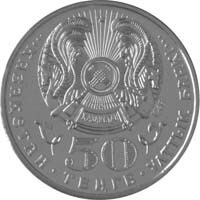 ?Б» on the right side; face value of the coin «50 TENGE» on the bottom sector; element of national ornament on the left and right sides of the face value of the coin; name of issuing authority in Kazakh “National Bank of Kazakhstan”. 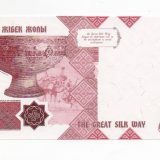 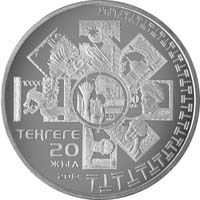 Reverse: image of the coin devoted to 20 years of Independence of Kazakhstan in a frame of seven stylized images of banknotes of national currency in the center; inscription in Kazakh “20 years of tenge” in three lines and the year of coinage «2013» on the left bottom sector; graphic symbols of the national currency – tenge along the circle on the left side of the coin.